The Triyodasi coming on a Saturday is called as Sani Triyodasi. On the auspious day of Sani Trayodasi, People will perform tailabhishekam. 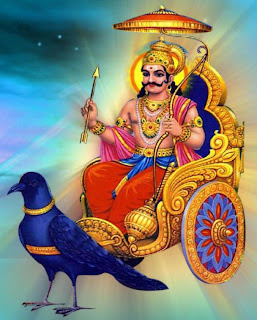 Some black grams, 100 grams of ginger oil packet, one kilo coal, a small black ribbon, 8 iron nails, some Navadanyams that is to be tied in a black cloth and donate the same to the temple priest or drop the same in a running water will definitely please Lord Shani Bhagavan. Offer food items to a crow and help the needy persons. Do not purchase oil, leather, umbrella, Navadanyams etc, on Shani Trayodasi. Distribute rice with salt meals to poor people. If possible proceed for offering food (Annadanam). "Neelanjana Samabhasam Ravi Putram Yamagrajam, Chaya Martanda Sambutam tam namami Sanischaram"
Shani Trayodasi occurs five times in 2012 they are January 7, 21, June 2, October 13, 27.